The current church consists of chancel, nave, north aisle, south porch, and western tower. It was built in 1852-4 presumably on the site of the earlier medieval church. The building is Early English in style and is set on a plinth. Its orientation is SSE-NNW rather than a straight E-W. 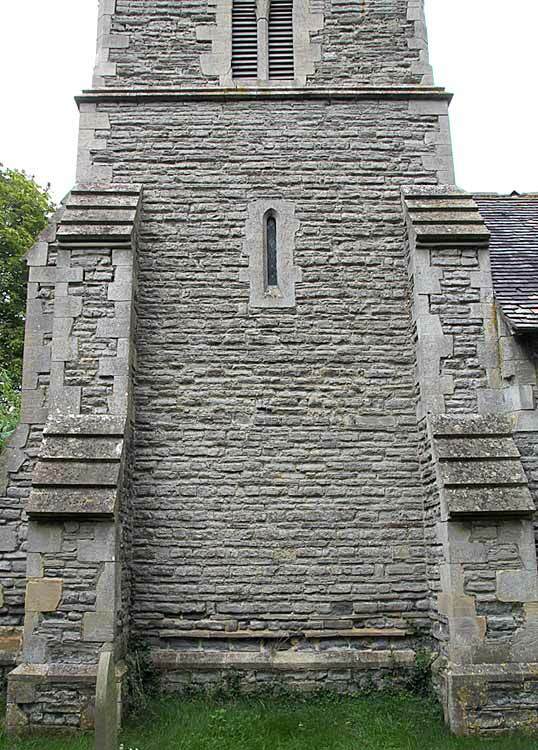 The angle-buttressed tower has an ashlar cornice with dogtooth decoration. The nave and north aisle are separated by an arcade of 3 bays of octagonal piers with moulded capitals supporting chamfered arches. 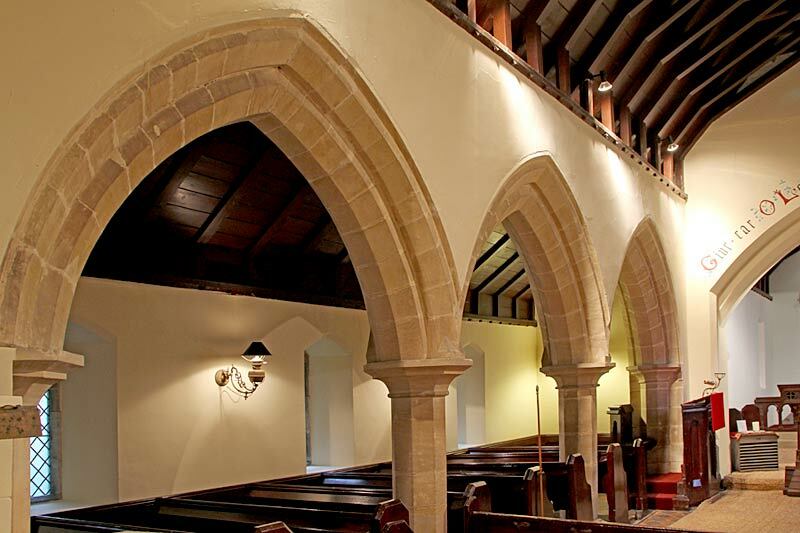 There is a chamfered arch separating the nave and the tower and a chamfered arch separating the nave and the chancel. The chancel has an arched doorway in its north wall and piscina in the south wall. The interior porch doorway is arched. 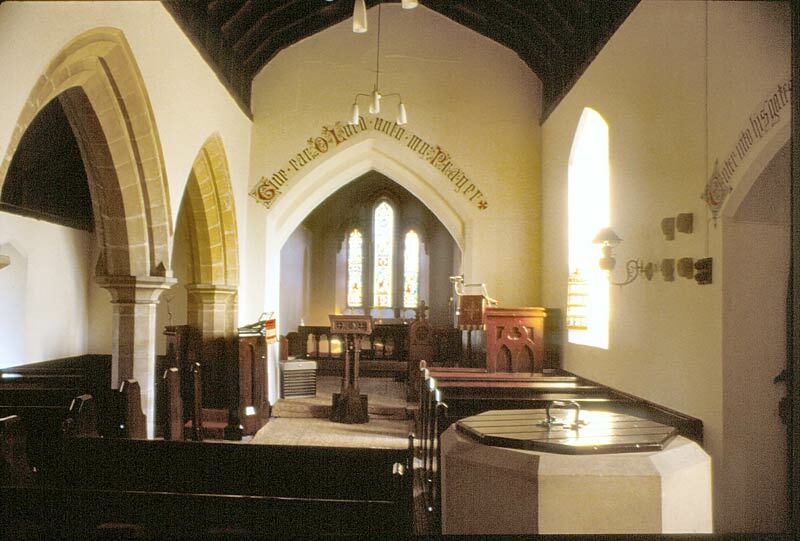 There is painted stencil decoration over the chancel arch, tower arch, and south doorway; it probably originates from the rebuilding of the church in 1852-4 but has been repainted many times, most recently in the late 1980s. Slab lying in the churchyard, 20 m south of the nave of the rebuilt church, discovered in 2015 when vegetation was cleared. Intact slab (but cracked into two main pieces) with incised design, a round-leaf bracelet cross with a ball at the head of the cross shaft and a two-stepped base. 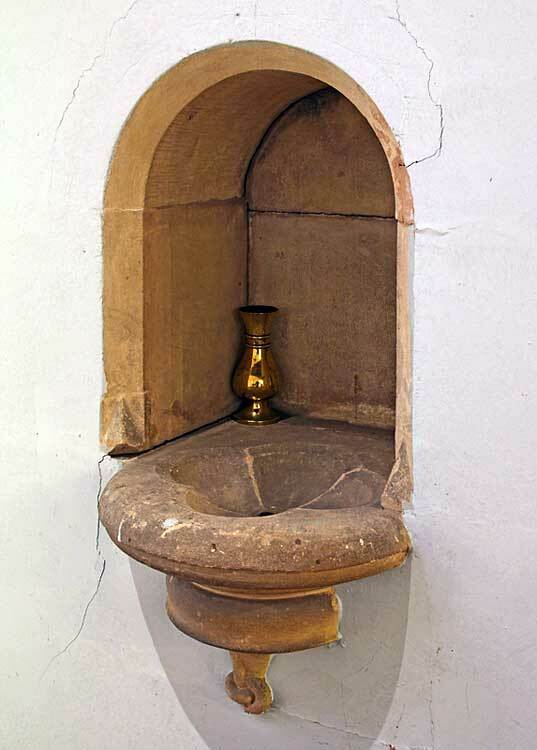 This is very much a standard ‘Nottinghamshire’ design, stylistically of the later 12th century, but occurring in such large numbers that it may have remained in use for longer. Description and drawing of the cross slab courtesy of Peter Ryder. Main Open rafters, 1852-4. Open rafters, 1852-4. Open rafters, with diagonal bracing, to support pyramidal roof above; 1852-4. N.Aisle Simple boarded lean-to type; 1852-4. Simple double beam structure of fir. Elphick 'B' type, Pickford Group 1.C. 1852-4. Not scheduled for preservation Grade 4. Plaster covering & date Plastered and painted, C19th and C20th. Plastered and painted, C19th and C20th Open stonework 1852-4. Potential for wall paintings Stencil text painting over chancel arch, tower arch, and south doorway. Probably C19th but repainted subsequently. Further hidden text possible. No evidence of painting, but hidden text possible given its occurrence in the nave. None. There have been no known archaeological excavations. The fabric dates entirely from 1852-4 with some small areas of later restoration. The entire church is probably on the site of its medieval predecessor, but this has not been established. It is expected that below-ground stratigraphy will be very heavily disturbed throughout, although remnants of medieval deposits may remain at depth. The standing fabric was entirely rebuilt in 1852-4. The churchyard is very roughly circular but truncated to the south, with the church positioned towards the eastern end. Marked burials appear to be present only on the south side, but earlier inhumations may exist elsewhere in the churchyard. The overall potential for the survival of below-ground archaeology in the churchyard, is considered to be LOW-MODERATE, comprising mainly burials of post 1854, and much evidence of rebuilding in the C19th. It is a possibility that the medieval church was sited elsewhere in the churchyard, offset from the present building, in which case the potential for surviving medieval deposits is UNKNOWN. Below the present interior floors of the rebuilt church it is considered to be LOW. The standing fabric of the church is all C19th rebuilding and the potential for surviving medieval archaeology in the standing fabric is considered to be LOW, with the possibility of some reused material. Exterior: Burial numbers expected to be low; this has never been a large settlement and some burials may have taken place at nearby Staunton in the medieval period. However the true extent of burials has not been established and medieval graves may exist. Interior: Stratigraphy under the church is likely to be very heavily disturbed mid-C19th rebuilding layers but with the possibility of some survival of medieval deposits beneath.